Orders placed by 2:00PM (MT) will be shipped the next work day! email slides@gammatech.com or call (505)293-9440 for a quote. No rush charge. Orders received by 2:00PM Mountain Time will be shipped the following work day. No minimum order. 1 slide is fine with us. No file type restrictions. We can handle just about anything. No extra charge for large files, if you have the time to send it we'll shoot it. No extra charge for Archival slide sleeves. all orders are shipped in archival sleeves. No extra charge for problems. We love a challenge. No unexpected extra shipping charges. We won't increase your charge, even if we loose money! We make every effort to begin every job as it arrives, and ship it as fast as we can, but we will not ship any order that does not meet our quality standards. If you have tight time requirements please call us to confirm the schedule. Below is a chart of cut-off times which you may find helpful. The owner, Charlie Dodge, first became involved in digital imaging in 1982! Gamma Tech, started in 1990, has specialized in Film Recording since 1992. We know the technology and how to produce a quality image better than just about anyone. We image files for professional clients who demand the best, just like you. During our peak demand for this service in the late 1990s and early 2000s we were shooting over 12,000 digital slides every month for use in planetariums, theaters, IMAX & DYNAMAX, and for companies and individuals all over the world. Our film recorders are balanced to a unique and precise calibration curve and monitored daily. All digital slides are imaged at optimal resolution, providing the best image detail and quality. All film is processed by one of the highest rated E-6 film labs in the country, mounted in thin white plastic mounts sleeved and shipped in heavy archival plastic pages. Over the years demand has become less, but our quality standard has stayed the same. Nothing sits around. If we see a potential problem we will contact you immediately. All orders are imaged within just a few hours of receipt, and quick shipping options are available to meet your tight deadlines with NO rush charges. If you're not happy with anything we do, even if it's your mistake, we will fix the problem quickly, refund everything (including shipping) or sometimes both. We work for you, and we treat you the way we would like to be treated. With this easy and secure 1 page upload form you can send up to 24 files, select shipping and payment options and hit the upload button. If you have more than 24 files you can either upload more than one set and have them all shipped together, or you can use our built in FTP interface and upload any number of files. You don't need a DropBox account to send files to our account. Just follow the link on our order page to open a new tab and select your files to send. Once you have the files uploading, just go back to the first tab and fill out the order form. Submit the form, and once the files complete uploading your order is complete. Simple. Mail files, prints or negatives. Fill out this easy form and hit the print button. Send the form with your files to us for imaging. You can send digital files, negatives, or prints up to 8x10 inches. 35mm full frame size is 4096 pixels by 2732 pixels. The slide mount cuts into the image area slightly, leaving approximately 3840 pixels by 2560 pixels. You do NOT have to send files in these exact sizes, we can handle that part. We recommend your files be 1800 x 1200 pixels or larger. (smaller files may seem out of focus when projected). If the image looks good full screen on your monitor it should work fine for a slide. We can work with many file types but we suggest JPEG or TIFF files. Slides are mounted in 2 x 2 inch plastic mounts. Unmounted strips can be shipped if requested. We are committed to protecting copyrights. Each customer is required by US law to own the right, or obtain permission, to use any image before the image is uploaded for imaging at Gamma Tech. 72ppi or 1200ppi are all the same for film recording, it doesn't matter. What makes a difference is the number of pixels in the image. We recommend at least 1200 x 1800 pixels. For most purposes, such as art show submission, if the image looks good on your monitor when viewed at 100% it will be fine for a 35mm slide. For publication or portfolio a larger image would be suggested. (See the advanced section for more information on resolution and high resolution imaging.) The file size (in Mb) is not critical. We have no maximum limit on what you can send. This option will either remove data from the image to make it have less pixels, or insert data into the image to make it have more pixels. In either case the quality of the image is changed by re sampling. If your image is 1000 pixels wide and you resample it to 500 pixels, 1 of every 2 pixels in each dimension will be deleted to make the new image. If you resample from 1000 up to 2000 pixels the software will add intermediate lines in each dimension based on the original image, and give you a new image 2000 pixels wide. In either case, the quality will be affected by re sampling, which is why we don't recommend re sampling your images before sending them to us. This option will only change a bit of code in the file, which will be read by some output device (such as a printer) to determine how many pixels to use for each inch printed. If you have an image that is 1000 pixels wide, and the file resolution is set at 100 pixels per inch, a print from the file will be (1000 pixels/100 pixels per inch) = 10 inches. If you change the resolution to 500 pixels per inch, the resulting print will be (1000 pixels/500 pixels per inch) = 2 inches. In both cases the image is unchanged, only the data in the file header has been altered. All film recorders are based on fixed sizes (35mm, 120, 4x5 etc). Resolution in the file header is not used and the image is interpolated by hardware to the appropriate size for the film being recorded. Some companies use this as an advertising point, saying that your files are exposed at exactly 1:1 with no re sampling, giving you the sharpest image possible. The fact is that any company using film recorders is doing exactly the same thing, that's just the way it works, and the hardware interpolation is much better than a re sampled image because the film recorder hardware is customized to produce the optimal result with that particular film recorder. For good quality 35mm slides we recommend files 1800x1200 pixels or larger. Smaller files can be acceptable if there is not much fine detail in the image. Smaller pixel size images will appear less sharp on film. A chart of recorder resolutions is given below. Full frame 35mm slides are 4096x2732 pixels, also called 4K. We can image at higher (or lower) resolutions, but 4K is optimal for 35mm film. 16K is optimal for 4x5 film, but often 8K is used since there is no quality gain if the original file is smaller than 8k resolution. *Digital cameras require approximately 3-4x the Mega pixel numbers of film to produce equal resolution since each pixel on film can be any of 16 million colors, while digital cameras require several CCD red, green, and blue cells to produce one pixel of color. By default your image will be rotated if necessary to produce the largest image on the film and scaled so that nothing is cut off by the mount. If the image does not fill the frame, the extra space outside your image will be black by default. If you want the image to fill the live area you will need to crop the image to to a 2:3 aspect ratio (4x6, 6x9 8x12 are all a 2:3 ratio). Images that are not in 2:3 aspect ratio are scaled to fit the 35mm frame with no cropping. The space outside the image will be black by default. If you need some color different than black you will need to add it. We view the image being recorded as horizontal (Landscape). 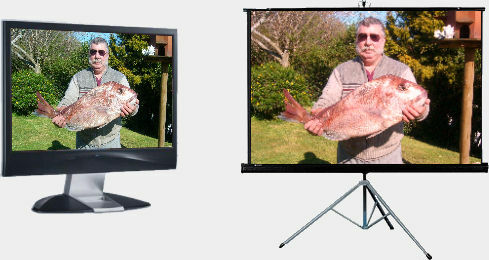 We rotate vertical (Portrait) images 90 degrees to give the largest possible image on the film. If you want a vertical image centered in the horizontal frame with black on the sides you will need to let us know when you place the order. We resize and add borders to images so that the image is not cut off in the mount. The aperture of the plastic mount is (approximately) 3840x2560 pixels, and does vary slightly depending on the lot number of the mounts. If you need mounted slides with no scaling we would recommend sizing your files to 3840x2560 or 4096x2732 for full frame digital slides. All slides are mounted in plain white mounts with no writing or imprinting. We can also send unmounted film, in plastic archival sleeves for no additional cost. You can work in any profile, but when you send files for slides they should be in either Adobe 1998 or sRGB color. We balance our film recorders to a neutral color, and a brightness curve that will match very closely to a calibrated display with the image in either Adobe 1998 or sRGB. (see "Viewing Slides" below) Images submitted in the wrong profile will not image correctly. We get asked quite often if we can provide a profile for the camera. The short answer is that it's not necessary, here's why. Each device, monitor, printer, film etc. is capable of producing only a part of the colors the human eye can perceive. This is called the color gamut of the device. The color gamut of a printer covers less color space than most monitors, so profiles are calculated to eliminate, limit or adjust the colors displayed on the monitor so they will closely match the color gamut of the output device and what you see will match what is printed. Film has the capability to produce every color you see on the monitor, and therefore no color profile is needed. This concept is illustrated by the chromaticity diagram shown here. 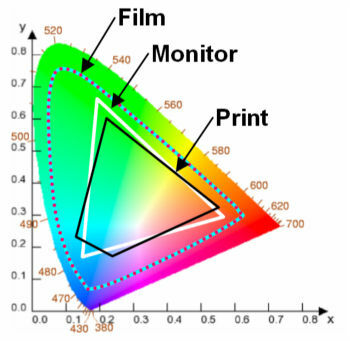 Because film has this capacity it is best to use the color space which reproduces the most colors on your monitor. Adobe RGB or sRGB would be our recommendation. Very few displays are capable of displaying more than the sRGB color space, so if your display is calibrated, and you can see the steps in the gray bar above, the slides you get back will look just like your screen when viewed correctly. We have written custom software to balance our film recorders to the absolute highest quality standard available, and we monitor both film emulsion and processing extensively. It took nearly 15 years to refine this process to our standards, which allows us to guarantee the most accurate color available. Because film can produce a much wider range of colors than a computer display, comparing the slide to a display is difficult. If you don't have a calibration system here's a very simple way to judge your monitor color, density and contrast without spending money on software and calibration devices. The scale below is a 16-step gray scale. First of all, it should look gray. You should also be able to see differences in the steps indicated. Steps 15 and 16 are difficult to see on any monitor, but you should at least see a difference from 14 to 15, and some LCD monitors may have trouble with the brighter steps. If this scale looks good on your monitor, and your files look good on your monitor, then you will be very pleased with your digital slides. We recommend sending files in JPEG format saved with high quality settings. At the same pixel size there will be no visible difference in a slide made from a JPEG or a tiff file, but the JPEG file will upload much quicker. Although we recommend JPEG, we can image film form TIFF, PSD, BMP, TGA, PDF, PowerPoint etc. When we receive a file we will preview and convert it before shooting. We convert the files to RLE compressed TARGA files, and during the conversion we also add borders if necessary to avoid cropping in the slide mount, and pre-rotate images if necessary. We let the camera hardware take care of scaling requirements to fit the image to the film frame. You may specify any special instructions for borders, crop or format on the order form when you submit your order. We don't use postscript rip software for presentation programs because there are always potential problems with rip software. Instead we rasterize files to the physical resolution of the camera so they maintain the highest possible quality. Files should be saved in 8-bit RGB, not CMYK. Color space should be either Adobe 1998 or sRGB. Other profiles WILL cause unpredictable results. Photo Shop files should be flattened, with no alpha channels. For more detailed information on specific file formats please refer to our Format page. We use the highest quality film recorders to produce your digital slides. The diagram to the right demonstrates the basic concept of film recorder operation. 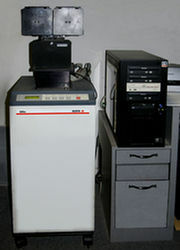 A film recorder consists of an extremely high resolution monochrome CRT, cut-off filters, shutter and a lens/camera option. The file is sent to the recorder one channel at a time: Red, Green, then Blue. If you were to look at the Film Recorder CRT during an exposure, you would see a bright spot of light scanning each line of the image, working it's way from top to bottom. The exposure takes from 30 to 90 seconds for 35mm, and up to 15 minutes for a full resolution 16k 4x5 or 8x10 exposure. For each image channel a corresponding cut-off filter rotates into the light path. 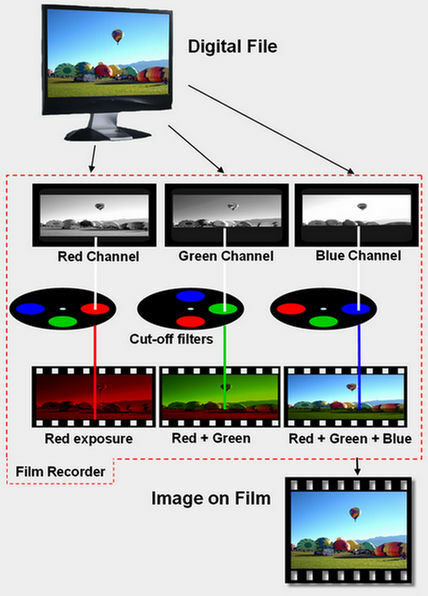 This results in Red, Green and Blue exposures on the same piece of film to form a complete image. When all 3 colors have been exposed the image is complete and the film can be processed. All 35mm digital slides are imaged at 4k resolution (meaning 4,096 pixels in the long dimension) using Agfa Alto 16k film recorders. Our calibration methods for this process are unmatched. If you send us a grayscale image you will get back a slide with no color bias - GURANTEED! Agfa Alto with 35mm bulk option. Agfa Altos with 35mm bulk and 8x10 film options. Even the best film recording is garbage without great film processing. In the past 30 years I've operated several E6 labs, and Gamma Tech has run film at 4 labs in the past 15 years. Our film is now processed by (in my opinion) the best E6 lab in the country. Processing is done at Denver Digital Imaging in Denver Colorado. 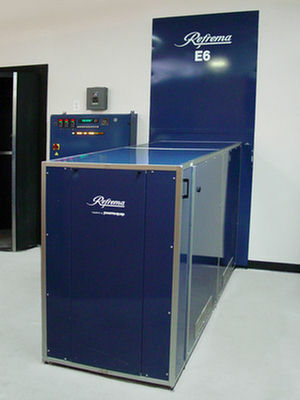 At right is a photo of their Refrema E6 150 GL-Custom film processor, which provides accurate and consistent processing from 35mm to 8x10 sheet film. Mounting, sleeving, final inspection, packaging and shipping of orders is done at Denver Digital by a team of highly qualified technicians. We stand behind our work 100%. If you are not happy for any reason with the quality of the recorded image we will either re shoot the film at no charge or we will refund the full amount of your order. The illuminator should have a color temperature of 5000K and a Color Rendering Index (CRI) or 90 or higher. The chromaticity of the illuminator surface should be approximately CIE Illuminant D50. The average luminance of the illuminator surface should be 1400 +- 300 candelas per square meter. If you don't have a viewer that meets these standards you may feel that the color does not match, and there won't be much we can do about it. Suitable illuminators are available from just about any supplier of photographic products. 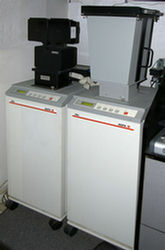 Our film recorders are maintained at a constant calibration for color and density. When viewed on a color correct light source the slides should match your display, however there are instances when this does not correspond to actual viewing conditions. The result is that you get slides that don't exactly match when projected. There are ways to correct this condition. The most common method is described here. This technique requires that you can directly compare the projected image to the display you're trying to match. The desired result: The transparency matches your monitor when viewed with an ANSI standard viewing device. The problem: The projector in this case is the wrong color temperature does not match the monitor and the projected image appears red. The fix part 1: First adjust the image (not your monitor) using an image editing program such as PhotoShop, Iedit, Corel Draw or whatever you use. Note which tools you use to adjust the image, and how much correction you add to the file. In this case let's say we add 10 units of red to match the monitor to the projection. The fix part 2: Starting with no correction make the opposite adjustment to the file that you made in part 1. In this case, since 10 units of red matched the off color projection, subtract 10 units of red and save a copy of the image. The new file, with the opposite correction, is sent for a slide which will be off color (-10 units red) but when projected will match the display, because the projector will compensate back to the desired color.